Sixmile Design has designed, built and developed all types of attractive and professional looking websites for clients in Ireland and the UK over the years and offers all types of online services. These days chances are the website is your first point of contact with your potential client so it is crucial the website design not only looks great but is functional so first impressions count. Sixmile builds all types of websites and provides multiple website design services. I am a graphic designer and website developer rolled into one. I can design a website that looks great while employing the functionality that is needed, trouble shooting any technical issues along the way. Most of the websites that I design and build are created in WordPress content managed system (CMS). You can view my Website Design gallery here. With around 50% of website traffic coming from mobile and others viewing on so many different devices it is vital the website design looks good not only on the desktop computer but also on the plethora of mobile devices used these days. It's worth noting Google's help page on "Building Smartphone-Optimized Websites" recommends a responsive web design above other approaches. 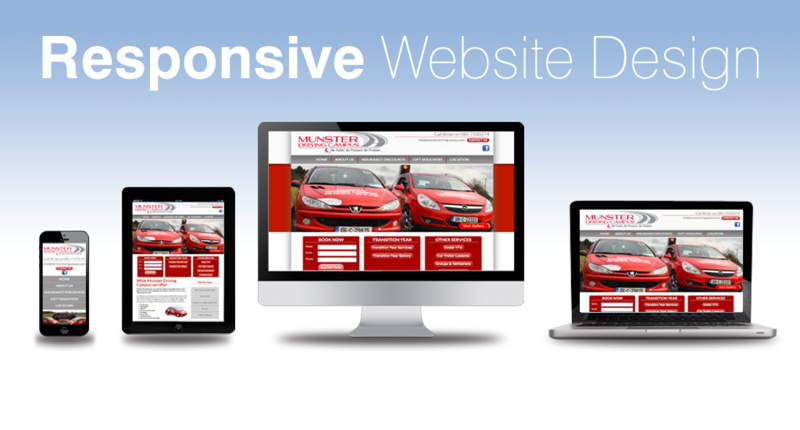 A responsive website design spells the end of pinching, squinting, zooming in and missing the intended button which, in turn, allows for a simple vertical scroll up or down. Most of the websites I design and build are created in WordPress which is a very popular content managed system (CMS) which allows for easy updates to the website content through a password protected admin panel. These updates could be in form of text, graphics or news articles or blog updates. Updating a website on a continual basis helps with your search engine rankings. More on WordPress websites can be found here. The art of SEO or your website being found online is a continual and changing process. Your website will be competing with millions of other sites to try and get people to visit. It is therefore crucial to optimise your site through SEO so that your website will be found above your competitors. In a nutshell this involves being aware of keywords that will get you found, updating your website on a continual basis and spreading brand awareness through engaging with the social networks. I work with my clients on their SEO on a continual basis making sure I keep abreast of the latest SEO practices. Setting up a blog on a website can be great for SEO as well. A blog or latest news section section means the website is updated with up to date information on you and your business. This is a great way to continually keep your website relevant with useful and engaging information which search engines lap up. Find out more on blogging here. More on SEO can be found here. The best person to do the copywriting for the website is you. You're in the best position to write about your business - you know your business. However, I also realise this can be difficult, off-putting or too time consuming for many so I can help here. All I need are a few lines of copy about what you do, your company and services on offer and I'll take care of the rest. When it comes to copywriting I take what you've given me and re write with SEO (Search Engine Optimisation) clearly in mind. Interesting, informative and detailed website content is crucial to being found on Google or any search engine. Beyond this, well written and unique copy is vital to engaging the reader and providing informative useful content people will find interesting. Your domain name is the unique address your website resides at. www.mycompanyname.com. Hosting is the space on a server where your website lives. I can set this up for you if it has not been set up already.